Dunlop AdhesivesNewsTile with time on your side with Dunlop Flexible Slowset! 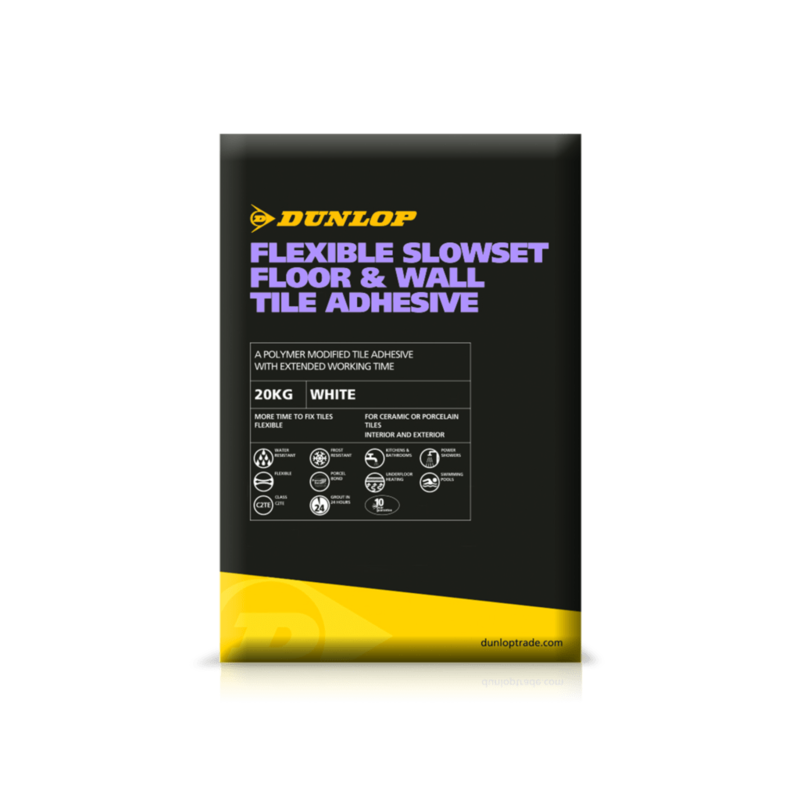 Tile with time on your side with Dunlop Flexible Slowset! We all know that certain tiling jobs call for more fixing time. That’s why Dunlop’s Flexible Slowset Floor & Wall Tile Adhesives sets nice and slow, giving you up to 20 minutes to fix and adjust your tiles. Water and frost resistant, Dunlop Flexible Slowset can be used internally and externally and is suitable for use with floor and walls tiles including porcelain, ceramic, mosaics, quarry tiles and brick slips. Because tiles can be adjusted on the wall or floor so long after positioning, it makes this new adhesive perfect for fixing large format tiles or tiles which are difficult to set out. A flexible C2TE adhesive, Dunlop Flexible Slowset is perfect for underfloor heating or swimming pools, and because of its slow-setting formulation it has a pot life of 4-5 hours after mixing – meaning less mixes for larger jobs. So for a change of pace and a quality professional finish every time, choose Dunlop Flexible Slowset!